Video: Iotize Systems in 10 Mins! - Turn-key connectivity for embedded systems. This demonstration video shows the implementation of IoTize's TapNLink NFC-Bluetooth Low Energy radio module on a microcontroller-based, industrial system. In this demo, TapNLink exploits the SWD debugging protocol via a standard SWD/JTAG connector in the target industrial system. This connection gives TapNLink read/write access to variables in the target system's Cortex-M core-based microcontroller. 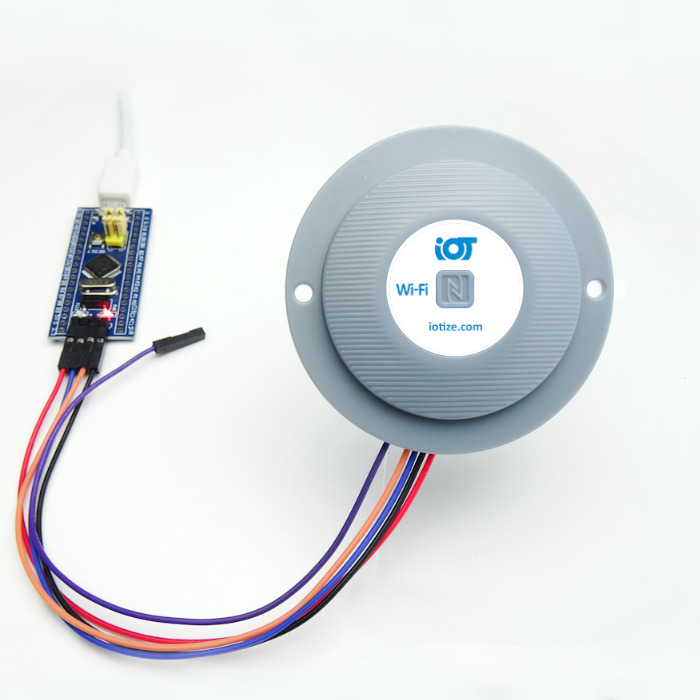 This is the ideal solution for creating an iotized Proof-of-Concept in just a few minutes so that design teams can explore the interest of NFC-Bluetooth connectivity using a working model of the connected system. SWD is just one of several protocols supported by IoTize products to connect to target systems. WIth it's additional security features, S3P is the ideal solution for the deployed systems. For more information about S3P, refer to the application note AN03-Changing Target-Tap connection from SWD to S3P in the our Technical Library. The TapNLink NFC-BLE Primer shown in this video, is a complete evaluation kit for implementing connectivity in a microcontroller-based electronic system. With this Primer, users can add Near Field Communication (NFC) and Bluetooth Low Energy (BLE) interfaces that allow mobile terminals such as smartphones to connect to an embedded system. The mobile terminal can then be used to configure parameters (write access) or to monitor data (read access) locally on a graphical interface. This graphical interface is created instantaneously when the user configures the Primer. Data that is being monitored locally on the mobile terminal can also be sent to a Cloud platform that is dedicated to the user's Primer. This allows users to immediately explore the possibilities for collecting and monitoring data remotely on the Cloud. This dedicated Cloud environment is -pre-provisionned and configured so that users can explore the possibilities without getting bogged down in the details of Cloud implementation.